The use of market mechanisms can help governments cut emissions even more than the minimum amounts offered in pledges under the Paris Agreement, according to a new report by IETA and Environmental Defense Fund. China's National Emissions Trading System, Implications for Carbon Markets and Trade report. To view Jeff Swartz China National ETS paper, please click here for download. IETA released its ‘market provisions for the Paris 2015 Climate Agreement’ policy briefing ahead of COP 20 in Lima. IETA’s Straw Proposal on “Market Provisions for the Paris 2015 Climate Agreement is available here for download. 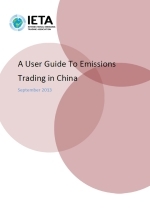 Download the pdf version of the report A User Guide To Emissions Trading in China. This ‘User’s Guide’ to Emissions Trading in China,’ is the first attempt by IETA to take a closer look at all aspects of the pilot emissions trading systems under design and implementation in China, with a long view for the prospects of a national carbon market. We’ve provided briefings on each of the pilots in China for IETA members over the last 18 months, and this guide complements those briefings by stringing them together and understanding how they will fit into the designs of a national market and incorporate the newly-launched CCCER offset methodology. The B-PMR got off to a strong start in 2013 with a week-long mission to the Shenzhen and Guangdong ETS pilots in China. Invited by local government leaders, the B-PMR organised a team of IETA experts from 20 companies to meet with local businesses and policymakers in southern China. We are building the B-PMR with a clear objective: to support the development of good business practices in the operation and/or design of market based instruments to reduce emissions of greenhouse gases in new jurisdictions that are developing emissions trading and carbon pricing policies. Our next Missions will take place in Seoul in September, 2013 and Shanghai in October, 2013. This guide incorporates the information we’ve gained from the our workshop and BPMR Missions in China, and puts it together with all the publicly available official documents related to the draft rules on emissions trading in the pilots and nationally. We hope that it will continue to be a ‘living document,’ that we can update and revisit annually so that it becomes a go-to guide for anyone interested in knowing the in’s and out’s of emissions trading in China. Please click here to view the ICAP 2016 Status Report. Globally, 39 national and 23 sub-national jurisdictions have implemented or are scheduled to implement carbon pricing instruments, including emissions trading systems and taxes. The world’s emissions trading schemes are valued at about $30 billion, with China now housing the world's second largest carbon market, covering the equivalent of 1,115 million tons of carbon dioxide emissions. The World Bank Group and others are encouraging countries, sub-national jurisdictions, and companies to join a growing coalition of first movers supporting carbon pricing.